This hysterical message today from the Democrat Party! Republican Wunderkind Paul Ryan is coming to Portland! Maybe they know something we do not. It has not been confirmed yet. Democrats must be concerned. 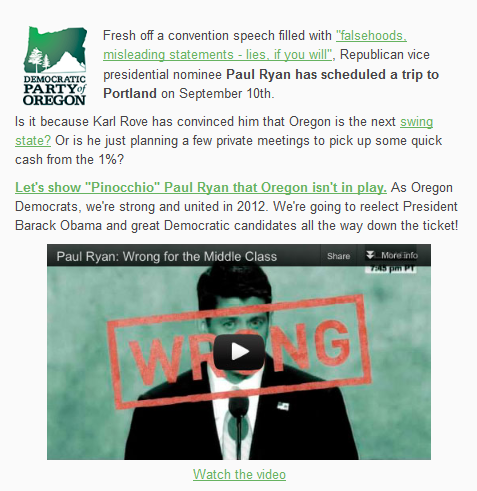 They’ve sent out a central planning video outlining Ryan’s “lies” in his speech which, as many reporters have pointed out, aren’t lies at all. Not even close. (1) They begin with video of CNN reporters discussing accusations of Ryan’s “lies.” This is proof that the Obama campaign sent out a lot of angry emails, and nothing else. (3) The GM Plant – Part of the factory Ryan mentioned was shut down under Bush, despite the initial GM bailout (which Senator Obama supported). The plant finally fully closed in April of 2009, during Obama’s presidency, as this report clearly states. (5) The debt commission – What Ryan said is absolutely correct. The Obama ad quotes Chris Wallace, who notes that Ryan was on that commission and voted against it. True. He refused to abide the section maintaining Obamacare, and voted no on its final findings. Still, he was intimately involved in the group’s deliberations and proposed solutions. Not fully happy with the final outcome, he went on to craft two budgets of his own, with numerous elements based on the Simpson-Bowles framework. The commission’s Democratic co-chairman (Bowles of Simpson-Bowles) has praised Ryan’s proposals to the hilt. 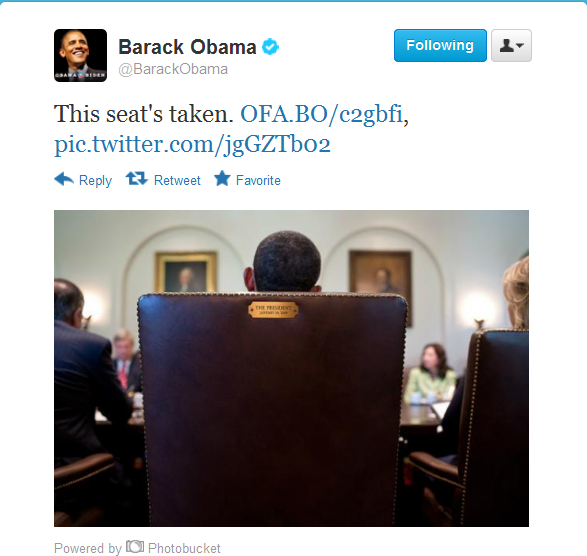 Mr. President, That’s Not Your Chair. That’s the People’s Seat. How Did You Escape From the Ideological Plantation? What’s your story for why you left the Democrats? Dana Loesch of Breitbart shows how to shame a selective dilettante “war” protester who’s simply a republican hater. 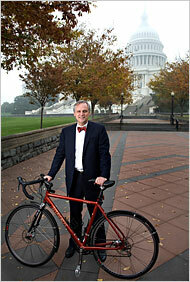 Earl Bow Tie Blumenauer "No Fiscal Cliff" and Global Financial Collapse "Best Opportunity"
Congressman Earl Bow Tie Blumenauer has had some interesting things to say about the global financial meltdown and the coming fiscal cliff. His observations make him look like a man out of touch with reality. This is not surprising, considering he’s become a millionaire after all these years in congress. Rep. Earl Blumenauer, D-Ore., thinks the catastrophe predicted if a combination of expired tax cuts and $102 billion in mandatory spending cuts go into effect Jan. 1 is overblown. The fiscal cliff, Blumenauer says, is really more like a gradual and manageable “slope.” The mandatory spending cuts, coupled with expiration of the tax cuts enacted during President Bush’s first term are at the center of the fight over how to shrink the nation’s $1.2 trillion deficit and $15 trillion overall debt. Interesting: the world wide fiscal meltdown is an “opportunity” for more spending on street cars and light rail and taxmegeddon is manageable. Quite some management of this opportunity of this so far. 8.3% unemployment and $5 trillion in new debt. Great job, Bow Tie. 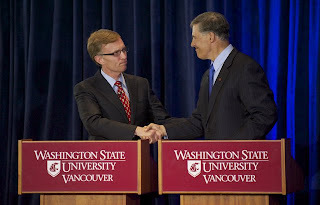 Inslee…emphasized that the residents of Clark County should be fully involved in the discussion about building the bridge and…said that the bridge won’t be built until the community figures out how to include light rail as part of the bridge. “This is a reality, and it is important for those who want to lead this state to say that, because if we are going to depend on these hundreds of millions of dollars from the federal government, we are going to have to have leadership that will make sure that we get this light rail built. I will do that,” he said. KATU asked who won the debate and declared McKenna won on both style and substance. We didn’t need a poll for that. I’ll be culling through these today but wanted to give you a chance to do so as well. Isn’t it great of KATU to have broadcast this event live? Thank you! 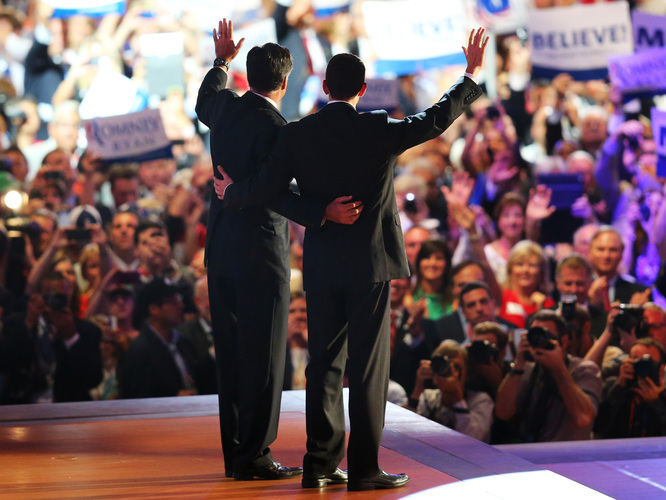 Republican Presidential nominee Mitt Romney left the Republican National Convention today to attend the National American Legion Convention in Indianapolis, IN, on Wednesday, August 30, 2012. 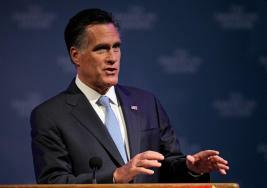 See account of Romney’s speech here.